The Massey Area Museum is entirely wheelchair accessible. Service animals are welcome. In the Spring of 2015, the Museum received a Trillium Grant to install automatic door openers. Tours were available and the guides were knowledgeable and personal. Guides did not hurry their guests and took time to answer all questions. 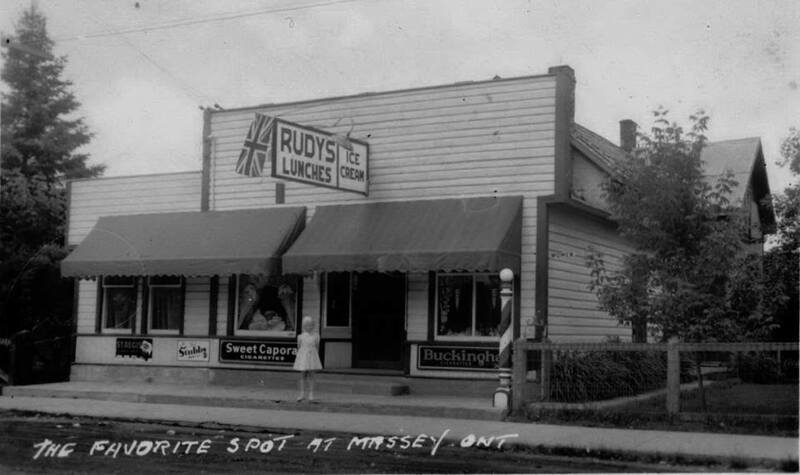 Rudy's Store on Imperial Street, two doors south of the United Church. He was also a barber. [Her hair was] so blonde it was almost white as a child! Rudy Karau, my grandfather, passed young, in 1959 I believe [from] heart attack while out hunting. My grandmother, Helga (nee Maahs), missed him terribly until she passed at the age of 88. I remember the icecream shop at the back with the fancy wrought iron chairs. Rudy was also a jeweler and sold some very fine pieces from this store. I believe that the beautiful little blonde girl would be Leona Rivers, Dina River's mom. [This] picture would be taken in the late 1930s.